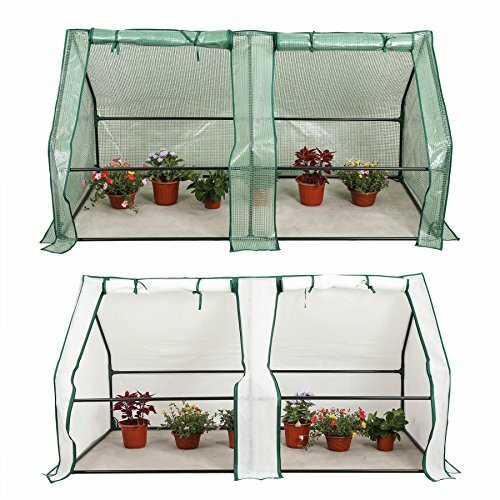 CO-Z Portable Greenhouse Mini Hot House with PE and Non-Woven Cover, Waterproof Cloche Greenhouse and UV Protected Greenhouse Tent, 5.9’ L x 3.0’ W x 3.0’ H.
Our greenhouses are designed to protect your flowers and veggie plants from harsh weather conditions including rain, wind, and snow. Its high-quality, portable design will allow you to grow and maintain a beautiful garden across the continent. The easily-assembled greenhouse is composed of a PE mesh cover with rust-resistant steel frame. Your garden will not only benefit from sunshine; it will also breathe fresh air in its new spacious home. Take care of your plants in the best environment possible, year round. GOOD SIZED PORTABLE MINI GREENHOUSE, 5.9' L x 3.0' W x 3.0' H, weighs 5.5 lbs. super convenient to carry around for seasonal use. USER-FRIENDLY DESIGN, a zippered roll-up entrance for easy access, rust-resistant tubes for durability, and screened ventilation for ultimate air circulation. Greenhouses are lightweight yet sturdy enough to ensure long-lasting use. DUAL COVER FOR ALL SEASONS, comes with PE cloth and non-woven fabric cover to accommodate different needs in various weather conditions. MULTIPLE FUNCTIONS, UV protected, Waterproof, Reinforced. It is perfect for creating warmth and insulation, while allowing air, moisture and sunlight to filter through for optimal growing conditions. MINIMAL ASSENBLY, plastic connectors take the place of assembly hardware, so this small greenhouse can be up in no time.